What's The Lamest Exotic Car? An exotic car is a vehicle that's very rare, expensive, fast, and/or powerful. But just because someone spends a ton of money on a car doesn't mean it isn't awful. What's the lamest exotic car? With the obvious exception of the Ford GT, the previous decade's trend of retro-styled, limited-production vehicles rarely resulted in anything particularly desirable. 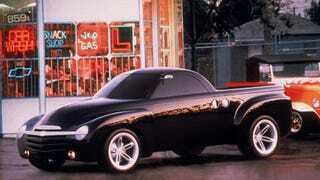 The Plymouth Prowler is attractive for what it is, but fails as a performance car. The Chevy SSR — which fits the exotic bill thanks to a relatively expensive price tag, but also thanks to its rarity — can't even claim to be attractive. While the former at least looks like a modern interpretation of a classic hot rod, the SSR is the recreation of a sporty 50s era convertible truck that no one ever owned. The Trailblazer EXT platform doomed it to un-sportiness and the original Vortec V8 meant it wasn't particularly fast. The addition of the LS2 V8 eventually made it powerful, but at almost $50K a convertible that isn't attractive mixed with a truck that, thanks to the convertible top, isn't useful as a truck, is a truly lame exotic. Excess doesn't translate to success: what's the all time lamest exotic car?